Hunger is a serious issue in our country, one that seems to be overlooked far too often. I, myself, have been hungry and had to go to various community resources to feed myself and my children. Therefore, this subject is very close to my heart and I was very eager to be involved in this project. ShopRite - Partners in Caring is an organization that helps fight hunger and has been doing so for 10 years. Learn more about the organization below. Since the inception of ShopRite Partners In Caring (SRPIC) in 1999, General Mills has been one of the program’s most supportive vendor partners, helping to fight hunger in communities across New Jersey, New York, Connecticut, Delaware, Pennsylvania and Maryland. For the last nine years, General Mills has honored ShopRite store associates and people in the ShopRite trading area who help fight hunger in their communities by featuring them on the iconic Cheerios and Honey Nut Cheerios boxes. The people who have appeared on these limited-edition boxes through the years are true hunger-fighting heroes. The box has featured ShopRite associates who help raise funds and awareness of the issue of hunger, food bank directors who are on the front lines of the fight against hunger, and community heroes, both children and adults, who go above and beyond to help provide food for the needy. Athletes, movie stars and celebrity faces may appear on other cereal boxes in supermarket aisles, but Cheerios is reserved for those who are engaged in the fight to end hunger. Once a year, all 217 ShopRite stores are asked to take part in a special contest. The stores compete against each other to raise money for ShopRite Partners In Caring and to promote awareness about hunger. At the end of the contest, judges from General Mills and ShopRite select the top ShopRite stores, who nominate two associates from their store to appear on a limited-edition Cheerios box. In honor of the 10th Anniversary of ShopRite Partners In Caring, four Cheerios custom boxes were created and sold exclusively at ShopRite stores. The first hit store shelves in September, 2008 to announce a search for ten community heroes that have given their all to help fight hunger. The second, in stores in January 2009, honored food banks in the Northeast for their endless support of those less fortunate. 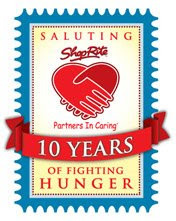 The third box, which was available in March, featured ShopRite store associates and the ten winning hunger-fighting heroes of the September 2008 contest. The fourth, a Honey Nut Cheerios box, will be in ShopRite stores in January, featuring bloggers who use their influence to spread the word about hunger and help raise awareness about the issue. The ShopRite organization recognized the pervasive problem of hunger experienced by so many people right in the neighborhoods served by their stores. It’s a problem that not only exists during the holiday season, when attention is focused on charitable giving, but it also exists throughout the year. ShopRite had already been helping to fight the problem of hunger for more than 20 years through its support of the Feeding America network (formerly America’s Second Harvest) and through participation in the Checkout Hunger program, but wanted to do more. In 1999, ShopRite conceived and began its ShopRite Partners In Caring program, a year-round, community based hunger fighting initiative. With the help of more than 50 manufacturers, the program is committed to helping to feed and meet the nutritional needs of families and the elderly who may otherwise go without. These generous companies are a major reason why ShopRite Partners In Caring has been such a success. *If you comment on this post, General Mills and ShopRite will donate one box of cereal to a food bank in ShopRite’s trading area for the first 30 people who comment on this post. I think this is wonderful -- let's get some comments rollin'!! What a great idea! Thanks for posting this Ang! It's wonderful to see a company such as ShopRite that's in the business of selling food to give so generously. One child going to bed hungry, one parent that cannot feed that child is one too many. The scenario is closer to each of us than we care to imagine. Thanks Angie for all your work and thanks ShopRite for your generosity in giving back. This is a wonderful program, and thank you and Shoprite for helping. I am going to see how I can help too! Love what ShopRite and General Mills are doing to help fight hunger in the US. Awesome program. Great that you are writing about and promoting it, Angie! This is wonderful. Every little bit really does help those in need. I absolutely LOVE this campaign!! I'm glad you are able to participate!! In this economy, it's wonderful to see people and companies like this one stepping up to the plate to led a helping hand! What a great campaign! Kudos to Shoprite! What a Blessing and I added YOUR Blog onto my Blog Post Angie!! Thanks for letting me know! 1 child going hungry is too many. There ae so many parents out there that g hungry to make sure that their children have something to eat. It is so very sad! I have this on my blog as well! Ihave even upped than ante a bit! Would you mind commenting? I think this is terrific...both that Shoprite and the bloggers are doing this! Thanks Angie! I think it's wonderful that you are here and participating, getting the word out about Hunger in America. Shout Out to General Mills & to ShopRite for doing this. I too am participating in this great endeavor to get the word out about Hunger in America and to affect a change. What a great cause! Hunger is so often overlooked in the noise of the cause de jour but without good nutrition all kinds of other problems arise. Great stuff! So glad that you are able to participate in such a wonderful program. Hunger is a huge problem everywhere and it's great to have people who actually care and want to do something about this cause. Thanks so much and glad I could help! This is a great thing. I love that such big companies do what they can to help the community. This is a great cause. I love that these companies are giving back to the community. Here's to one more box of cereal being donate! We never realize how good we have it until we so those who really are suffering. I am glad to contribute in anyway that I can. Makes me feel good knowing that a few more people will be fed. Great job in spreading the word.